If you’re a fan of Twilight and live in the Lewisville, Texas area, then Friday might be of interest to you. Friday, March 19th, Borders Books all across the country will be having a midnight movie release party for the New Moon DVD. 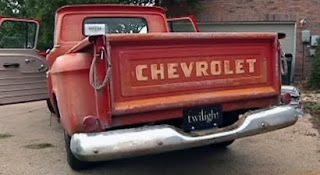 To add to the festivities at the Lewisville store, though, local celebrity (at least she is to us), Sterling Biegert will be in attendance with her pride and joy, Bella’s old Chevy pick-up truck from the movie. Sterling will allow photos of the truck alone, but if you want a photo of yourself sitting in the truck, a small donation will be asked. All donations go to Sterling’s favorite charities. Includes exclusive medallion necklace on a silver chain—gold side features wolf-pack tattoo design, silver side shows the Cullen crest. PLUS, enjoy over 25 minutes of previously unreleased EXTENDED SCENES such as Jake in Bella's Room and Edward meeting the Volturi and many, many more! INTERVIEWS with cast members Robert Pattinson, Kristen Stewart, Taylor Lautner, the Cullen Family, the Wolf Pack, the Volturi and Director Chris Weitz; unrivaled RED-CARPET FOOTAGE from the movie premiere; front row seats to The Twilight Saga: New Moon WEBCAST. Also includes additional Special Features: A revealing AUDIO COMMENTARY with Director Chris Weitz and Editor Peter Lambert; a riveting 6-PART DOCUMENTARY that takes you behind the scenes; exclusive band REHEARSAL FOOTAGE with Muse; and MUSIC VIDEOS from Death Cab for Cutie, Anya Marina and Mutemath. Just remember that even though Borders feels they have enough stock to meet the demand, supplies are limited. There will also be more ‘New Moon’ merchandise to satisfy even the most hard-core collector, so join them for food, fun, and ‘New Moon’ Friday, March, 19th at 10pm.